Exotic verbena, tropical verbena (not related to lemon verbena. A light brown liquid with a lemon fresh and fruity odor. 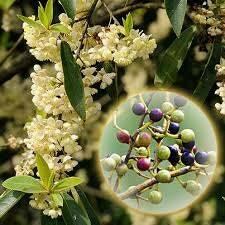 The scent of Litsea has been compared to lemongrass and lemon verbena. It is considered sweeter and finer than lemongrass and a possible fragrance alternative to the costly lemon verbena (not an alternative in terms of therapeutic potential). Safety Information: Litsea should be used diluted in a carrier or blended with other essential oils to decrease potential for skin irritation. The following essential oils are recommended for blending: Basil, Bergamot, Geranium, Ginger, Jasmine, Rose, Rosemary, Rosewood and Ylang-Ylang. Essential oils are natural aromatic compounds found in the seeds, bark, stems, roots, flowers, and other parts of plants. Essential oils can present very pleasant aromas and very powerful aromas. Essential oils are generally extracted by distillation, typically by using steam or other processes including expression or solvent extraction and cold pressed. Our Essential oils are most often used in soap production and aroma lamps for aromatherapy. Essential oils can also be used for adding scents to incense sticks and household cleaning products..
Naturals by Nana and our personnel are not medical practitioners and do not diagnose, treat or prescribe in any shape, manner or form. Always discuss with your medical practitioner before using any alternative medicines, natural supplements, or vitamins. All information, content and product descriptions contained within this listing/store are for reference purposes and are not intended to substitute advice given by a pharmacist, physician or other licensed health-care professional. You should not use this information for treating a health problem or disease or to make a self-diagnosis. Actual product packaging and materials may contain different information than shown. Contact your health care provider immediately if you suspect that you have a medical problem. Information and statements regarding Naturals by Nana products have not been evaluated by the FDA and are not intended to diagnose, treat, cure, or prevent any health condition or disease. The term ‘natural’ does not guarantee safety. Alan Root (Inula helenium) - Almond bitter - Bergamot expressed - Birch sweet - Birch tar - Boldo leaf - Cade - Calamus - Camphor (brown, yellow, unrectified) - Cassis - Cinnamon bark - Colophon - Costos Root - Fig Leaf abs - Horseradish - Mustard (volatile) - Opoponax - Peru balsam - Rue abs - Sassafras - Tansy - Tolu - Turpentine unrectified - Verbena (from citriodora) - Wintergreen (Methyl salicylate). Cajaput - Champhor - Eucalyptus - Fennel - Hyssop = Peppermint & Rosemary. We source essential oils from multiple suppliers. We are constantly searching for consistent essential oils at fair prices. Due to weather conditions essential oils can vary in both quantity available and quality. As with any formula, we always recommend you do your own in house testing. Testing in house will allow you to adjust formulas to create your own quality finished products. The photographs that I use for my fragrance and essential oils are stock photos. They represent the fragrance or oil, not the actual item pictured.